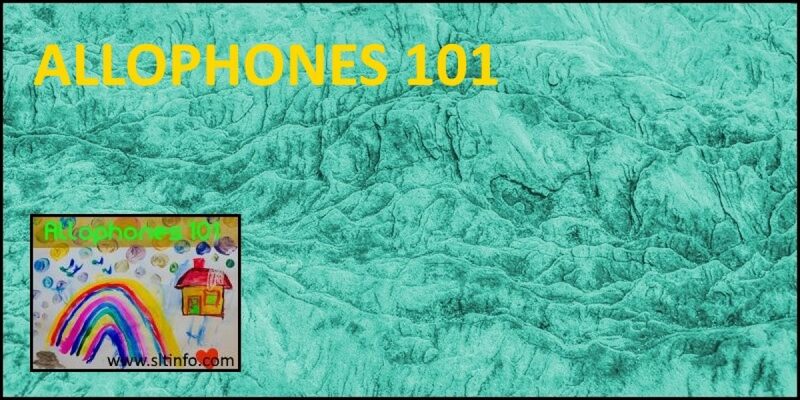 These themed introductory level articles entitled ALLOPHONES 101 are part of the Human Communication 101 series. The articles that constitute ALLOPHONES 101 clearly focus on allophones. These are variations in the way speech sounds (phonemes) are articulated in particular contexts, i.e. in particular positions in words, either when spoken on their own or as a stream of connected speech. In sum, allophones are variants of phonemes that are contextually determined. Typically, we write allophones in square brackets and use so-called diacritics – modifying marks that identify a particular feature of interest. In this case, the small ‘o’ beneath the symbol indicates de-voicing. Note that these allophones do not change the meaning of a word. So, even if we were to articulate the final /b/ of lab forcefully, with full voicing throughout, it would still be understood to have the same meaning as when it is articulated with a final de-voiced sound. Allophones 101 provides an introduction to some of the rules that govern the production of allophones in English: both vowels and consonants. The articles that make up this Human Communication 101 series about allophones assume an introductory level understanding of the following. PHONETICS: the study of speech sounds. It investigates the physical properties of speech sounds, how they are produced by the vocal tract, and how people perceive these sounds. The field is typically divided into three areas: acoustic phonetics, auditory phonetics, and articulatory phonetics. Speech therapists are particularly concerned with articulatory phonetics. ARTICULATORY PHONETICS: the study of how the vocal tract is used to produce (articulate) speech sounds. It studies how speech sounds are combined in words and in connected speech. In addition, it investigates how speech sounds vary their place of articulation in the vocal tract, their manner of articulation, the voicing, and so on. It examines the two main categories of human speech sounds: vowels and consonants. IPA (INTERNATIONAL PHONETIC ALPHABET) SYMBOLS: a notational system used to transcribe speech in order to create a written record that can be re-read and analyzed. With this system, there is an unambiguous one-to-one relationship between a speech sound and the written symbol used to represent that sound. For example, bass (meaning ‘a low-pitched sound or tone’) is transcribed as /beɪs/, whereas bass (meaning ‘a type of fish’) is transcribed as /bæs/. IPA symbols are used extensively in this volume and the reader should, therefore, have some insight into how each of the English consonants and vowels are transcribed. If you are in any doubt about your ability to understand the current series of articles about allophones, we strongly recommend that you first read the companion Human Communication 101 series entitled English Speech Sounds 101. This provides the foundation knowledge required to fully appreciate the ideas presented here.